(PhysOrg.com) -- A new study of the skeletal fossils of Neanderthal and Early modern man suggest the lack of a "throwing arm" may have made the difference in human evolution. Researchers Jill A. Rhodes and Steven Churchill, evolutionary anthropologists published their findings in the January 2009 edition of the Journal of Human Evolution. The paper entitled, "Throwing in the Middle and Upper Paleolithic: inferences from an analysis of humeral retroversion," provides some clues to the extinction of Neanderthal. Projectile weaponry was an important component of early man's survival toolkit. Traces of projectile weaponry have been found in Africa dating back some 80,000 years. The mass migration by early man out of Africa into Europe some 40,000 to 50,000 years ago, show early European man developed and used bow and arrows and other projectile devices. The Rhodes/Churchill small sampling of Neanderthal's skeletal remains indicate he was outmatched by early modern man's development of a "throwing arm". This anatomical feature is measured by the degree of humeral retroversion in the dominant arm and in bilateral asymmetry. Neanderthal's short squat body, massive limbs and lack of backward displacement at the shoulder joint may have hampered their ability to incorporate projectile weaponry. According to Jill Rhoades, an evolutionary anthropologist examinations of early modern European fossils show the backward displacement at the shoulder joint, but none of the small sampling of Neanderthal's skeletal remains carry this anatomical characteristic. Modern athletes like baseball pitchers have this characteristic in one shoulder joint and it is referred to generally as their "throwing arm". When engaging in over head throwing activity, such as throwing a baseball or a spear, this increases the movement of the muscles and gives greater velocity and speed to the throw, according to Steven Churchill an anthropologist at Duke University. This missing technology, along with climate change and competing arrow-shooting humans significantly challenged Neanderthal and may have led to an eventual extinction. According to the Rhodes/Churchill study, habitual behavior patterns, including those related to the production and use of technology, can be imprinted on the skeleton through both genetic and epigenetic pathways. Samples of bilateral humeri sufficient for measurement of Neanderthals are rare. The study consisted of two males and one female. The study concludes, that while the sample was small, consistently it was found that Neanderthal lacked the characteristic "throwing arm" found in early modern man. According to archeologist Eric Boeda of Paris X, Nanterre, Neanderthal was not without his resources. Boeda's team identified bitumen, a tar-like substance on sharpened stones in Syria inhabited by Neanderthal nearly 70,000 years ago. The bitumen was used as an adhesive to attach sharpened stones to wooden handle in a procedure called hafting. This finding by the Boeda research team using gas chromatography-mass spectrometry and carbon isotopes at 40km from the source places the hafting practice back 30,000 years from the date previously set in other research. Anthropologists agree, Neanderthal could throw spears short distances, but never graduated to the use of bow and arrows or spear-throwing technologies. Some 40,000 years ago, modern humans trekked out of Africa to Europe taking their bows and arrows with them for fishing, hunting and warfare. The bow and arrow enabled modern man to engage his environment and adapt to various environments. While it is cannot be stated with absolute certainty, Neanderthal's inability or lack of interest in developing projectile weaponry may have been an important factor in his eventual demise. Scientists are uncertain as to whether modern human used bow and arrows or projectile devices against Neanderthal, but it is a distinct possibility. For further reading on the subject, See Journal of Human Evolution, Volume 56, January 2009, Throwing in the Middle and Upper Paleolithic: inferences from an analysis of humeral retroversion, Jill Rhodes and Steven Churchill. Projectile weaponry was only useful for a hunter that was not living in dense forests. The change from dense forest/jungle to open savannah made modern man's running ability and throwing arm useful as opposed to neanderthal's ability to operate as an ambush predator. I am not doubting that thrown weapons were more useful against large prey in open areas, but to play them off as useless in dense forests and jungles is going a bit too far. Up in the trees would probably be the best place to find prey that is not likely to try and eat you in retaliation, and a good throwing stick is probably a superior option to attempting to out climb or out fly it. "According to the Rhodes/Churchill study, habitual behavior patterns, including those related to the production and use of technology, can be imprinted on the skeleton through both genetic and epigenetic pathways." This sounds very "Lamarckian" - the idea that e.g. giraffes developed longer necks via the habit of stretching to reach higher into the trees for food. I am a rank amateur in this stuff, but I thought this idea was thoroughly, completely and totally discredited and rejected by all of modern science, from Gould to Dawkins and everyone else in the field. Obviously, these researchers are credible, so I sit here in absolute astonishment at reading the quoted passage. Can someone shed some light on this for me? What they mean it if a tribe depends on throwing to survive selection will favor better throwers which will have skeletons more adapted to throwing. Basically the difference between this and Lamarckian view is that here the changes are due to random processes and then selection favors those changes which better suit the tribe (for example such individuals might have better status, more partners and more children). In Lamarckian view it would be that those who throw a lot pass this trait to their children. This is not the case. superhuman: Actually, certain actions can cause slight (*very* slight) genetic changes in the mother, which can be passed on to the child. I'm uncertain if the exact mechanism for this is known or not, as I haven't looked into it beyond the "huh, that's neat" level. But that is a far cry from straight Lamarckian evolution, which is just crazy. The sample is far too small to make such extensive conclusions. No doubt different weapons and tools were used depending on the area, season, climate, customs, lifestyle, skills, and the technological development of the people concerned. You need far more evidence. It's interesting how much efforts are thrown to prove that Neanderthals had some kind of intellectual/physiological disadvantage. I think we see the equivalents of the Arians ideology of the 20th century. In any case, I think the conclusions are very premature. The samples may not have had a throwing arm simply because they didn't need it. If someone find the bones of current university humans, what kind of arm would they have? You develop whatever you need. If they had a working way to secure their food, they would use it until it's relevant. And probably it simply was relevant for all of the sample groups they tested. I know it's a great mystery why they disappeared, but let's not get carried away by simplistic ideas. They could as well have been wiped out by a hostile bacteria killing off women in labor. Or something even weirder. There is much more digging to be done to be sure. A specie that is totally unadjusted to the environment will die straight forwardly. A weaker specie that is in direct confrontation with a stronger one will be killed and will go extinct. But in Nature things are rarely all black and white and environment don't change in a blink of the eye (unless you get nuked, meteorited or gamma-ray bursted). We don't have a sudden massive extinction of a specie, nor we have evidences of a predator that ate or killed only Neanderthals. We have slow disappearance over a quite long period of time. And that can be because of many factors. It's like you saying that Europeans are dying away, because we're less fit than say Chinese. We're not less fit, we're simply less willing to procreate. Sure, we're not a different specie, but it's a good analogy. Not everything in Nature is direct competition. Sometimes, there are simply other factors. I think that one of the reasons why evolution gets so much under fire is that people over-simplify it. Organisms form a complex system. Complex systems usually obey more laws than simple systems, because of the interconnections between the elements. Sometimes, they have absolutely unique properties coming entirely from their collectivity. You cannot expect a living system to behave in a classical way- live or die. It will live, it will develop some qualities, it will lose some, then a new factor will arrive, the system will have to adapt and so on. Eventually, it may die because of another specie, the environment or due to a sudden burst of bad luck. Or it can die from depression. And notice, that "eventually" is thousands of years after, during which there were many new and old factors, to which, the organism reacted in different ways, some of them unrelated to its final extinction, while other can be related to it. In short, life is complicated. What I don't like is that we're looking for all kinds of simple reasons. It's not simple. It's complicated and that's what we must explore if we want to know the Truth and not only to calm our minds. What is the AGW movement? As for the ambush predator, I don't think it's a correct analogy. Even an animal is very likely to seek for another feeding source. And we know of migrating species.If a simple bird can do it, maybe someone who was smart enough to create and use tools would have more ways to deal with such problem. I agree with your logic for the slow extinction. But if we talk about a specie with multiple feeding sources, like studies indicate Neanderthals were, then we clearly have a problem with that theory. Because it's unlikely that all of those sources disappeared. What's even more, there are enough humans (or animals) living in harsh conditions-they manage to survive even if in low numbers. Again, I disagree with the simplicity of those theories. 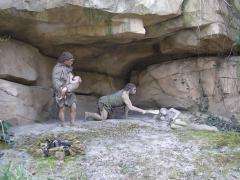 For Neanderthals, their habitat wasn't a closed system. They had plenty of options and the intelligence to explore them. The climate didn't change so quickly, they had plenty of time to change with it or to find a suitable place to survive. They didn't. Evolution isn't only about survival of the fittest. It's also about adapting to the new environment. That's why if a specie goes extinct, we must ask first what it lacked and then what prevented it from evolving or adapting. Currently, we simply don't have enough information about Neanderthals to know what exactly did they miss. We may speculate, but that's not science. (for example, I was very surprised to read that they are dolphins and seals, I mean, you can for example club a seal in some way, but dolphins don't usually wander on the beach. Mhm, and how exactly the dense forests correspond to the dolphins in their diet? Anyway, of course they had preferences for closed places, if I have to hunt, I'll chose such place also.It's simply easier to catch an animal there. Also, you cannot judge about their preferences of climate only by our discoveries, because they are very limited, we have much more to discover, especially under the water, since most of the habitable territory of Europe from the Ice age are now under the water. It's interesting that I think it was in the Mediterranean where there were some traces of Neanderthal skulls in the local population. That never was a cold place. And obviously they lived there for a long enough period to leave their trace for us to see it. Now, I'm not saying they didn't love the cold climate, but if you think about it, they could have very well moved North until they found a place where they felt ok. If they had the skills to deal with fish and seals and whatever, they could have survived. And with their better cold tolerance, they would have an advantage to Homo Sapiens. True, there are no dense forests there, but if you can survive on fish, then you simply eat fish. You don't die thinking how much you want a steak. And if they could survive there and they didn't fight Homo Sapiens then why there are no memories of such groups (or there are?). Why? I think that is to tell us that it wasn't just the cold or just the food. There was something more that stopped Neanderthals from simply continuing their life at some places. There is absolutely no reason for the two species not to coexist. There is enough place and resource on Earth. As for the rest of what you said, I'm sorry but I have problems imagining a human outrunning any wild animals. They are very very quick! People cannot hunt animals by outrunning them, because that's not an energy efficient way to get food. For me, this isn't a plausible explanation why we survived and they didn't. We might have had a better know-how for hunting in open plains, but if we shared similar intellectual abilities, there's no much reason why no one from Neanderthals wouldn't find out how to hunt in the open. And then, we're back in the beginning. That's why I compared the Neanderthal theories to the Arians theories - we simply so much want to believe we were in some way better, we don't allow the thought that maybe we weren't! Maybe we were just lucky. Maybe there was a rare bacteria that killed mostly Neanderthals. Or sterilised a big percentage of them. Maybe they preferred to live in small groups and thus with time, the genotype got damaged which led simply to slow extinction for every little group (though with homo sapiens, that's not what happens in small societies). Or something like this. I'm not saying this makes more sense than the "throwing arm", it doesn't. But until we have a full DNA sample and more information, all we say or think are simply speculations or at best, educated guesses. With current information, it's easier to believe that they were half-aquatic creatures that eventually went back to the water while the rest died. It sounds crazy, but it's just as speculative as the throwing arm. After all, they were around for so long, who knows what goodies they evolved. And whatever we found, we can never be sure we have the full sample of the specie. It's like finding 5 pink elephants- you can never deduce all the elephants are pink. Especially if you haven't studied most of the habitable land during the Ice Age. Well, marathon isn't exactly a used skill apart from olimpiads. And I'm not sure what good will do you if you want to catch an antelope if you can run for days (or hours). Running in such distances requires perfect economy of energy. Even if you can catch up an animal at some point, you'll be way too tired to hunt. Sure, it's a useful skill when you're running from something or after something, but not for casual food gathering. And in the end, why should you do that? When you can simply know the habits of the animals and make some kind of trap. Using spears of you want. See, I'm a physicist. For me, things are to be done at the lowest required energy. No living creature will do something that's not energetically effective- even my dog won't bother to go to the food and eat standing, when he can take the food close to him and eat lying. There's absolutely no point in running for hours or days, if you have the minimal intelligence needed for you to find the best place for throwing a spear. Or to make a collective hunt in which some of the people will scare the animals while others will ambush them. Again, there's not a great need for too big running skills. And even if we assume that they didn't have such intelligence, it's hard to imagine that running with hours after an animal will give you a better chance to kill him than simply killing him wherever you meet it. That was about Homo Sapiens and their running skills. As for the Neanderthals, all I'm saying is that we're merely speculating. As you said it- you might prefer warm weather, but you still can find a way to have a comfortable life in cold weather. Maybe so were the Neanderthals? That's why for me, it's hard to understand your passion when you tell me what it's obvious how Homo Sapiens survived. It might be obvious for you, but that doesn't mean it's scientifically obvious. In the best case, it's the best model for the current data. And the fact people continue to research the reasons behind the extinction of the Neanderthals should tell us that it's not only me that finds this models for not very convincing. Don't waste your time on V, he will argue forever just to argue, having no relevant knowledge of the subjects never stops him. As you prove his arguments wrong he will just come up with new ones, it has some entertainment value as they tend to get more and more bizarre, but don't expect to actually teach him anything or that he will admit he is wrong. I see he's already shared some very deep insights with us here: "Modern men where runners since that is the only way to get somewhere" or "Scientific answer is not always correct cause people like to stay fit". Anyway I've been through this myself too many times so I decided to warn others who might not know what kind of arrogant ignorance they are against. Hihi, thanks for the warning superhuman. Anyway, I won't continue the argument in any case, because it got too long. And I don't believe you can convince people by arguing with them, you just give them information and eventually they convince themselves if they want to. Velanarris-the gym argument wasn't really relevant. If you consider it carefully, you'll see that everything in our behaviour is based on the economy of energy - though in modern times that would translate "pleasant things are energetically more economical than boring ones". Brain chemistry, go figure. In my country we have a saying "give the lazy man work and he'll teach you how to think". Or something like this. The idea-there's no point to do things in a complicated and exhausting way if you can do it in a simple and fun way. And you don't have to run to get anywhere. You can walk, crow, swim or fly. In the case, walking is fine. You simply don't accept the fact that we're not talking about animals, but about thinking beings. Even tigers and lions know where they have best chance to catch prey, why do you think Homo Sapience and Neanderthals didn't know that? It's simply not logical. Running too fast or too long is simply unnecessary for the whole population.